INDUSTRY.co.id - Jakarta- The richness of art and culture as embodied in various traditional fabrics is unique to the Indonesian fashion industry. Speaking of fashion Indonesia, the market will get acquainted with 'fashion craft', which is fashion products are enriched with the value of the art of hand work. This is the strength of the Indonesian fashion industry when entering the world fashion market, even though it takes a different production time with the speed of the fashion industry in general. 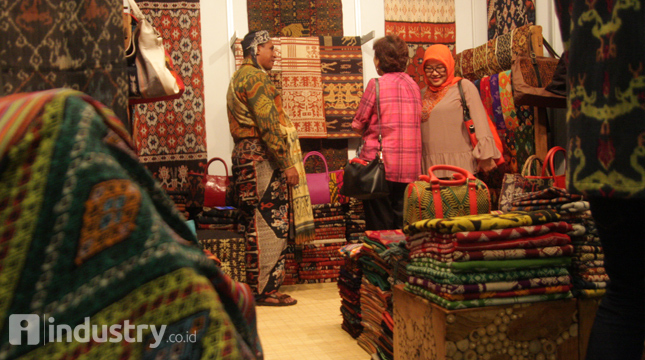 The Ministry of Industry has implemented several activities to introduce the uniqueness of Indonesian fashion to the world while increasing the export of TPT (Textile and Textile Products), one of them by attending the exhibition abroad. This year, the Ministry of Industry through the Directorate General of Small and Medium Industries (Ditjen IKM) will send 9 fashion product labels at Collection Premier Moscow (CPM), a fashion trade show held at Expocenter Fairground, Moscow on August 30 - September 2, 2017 . "The Heart of Fashion Craft Indonesia is the real step of the Ministry of Industry to introduce the fashion industry of Indonesia with its fashion craft that can penetrate the international market," said Secretary General of Small and Medium Industry (IKM) Kemenperin, Eddy Siswanto during the Press Conference Fashion exhibition CPM Moscow 2017 in Kemenperin Office, Jakarta, Tuesday (22/08/2017). He added that the nation's industry players are expected to no longer just struggling as local players but also build capacity to compete globally. "This is to realize the vision of Indonesia as one of the world's fashion centers within the next decade," he explained. According to Eddy, by participating in international fashion trade show such as CPM in Moscow, of course not only to attract buyers and international media, but also an opportunity for Indonesian fashion industry players to see international ready to wear business opportunities and business transactions. "It is expected that the synergy between the designers to prove creativity, and attract consumers in their respective countries," he added. In addition to the Ministry of Industry, the presence of "The Heart of Fashion Craft" in CPM is also realized with the support of the Ministry of Trade, BKPM, PT Bank Negara Indonesia (Persero) Tbk, PT Telkom Indonesia, and PT Telkomsel. Furthermore, Eddy said, this is a testament to the goodwill of many parties for Indonesia's fashion industry can be taken into account in international markets. "With a more established industrial structure for the future of Indonesia's fashion craft industry can build a more competitive business and grow to the fashion lovers of the world with a consistent," he concluded.